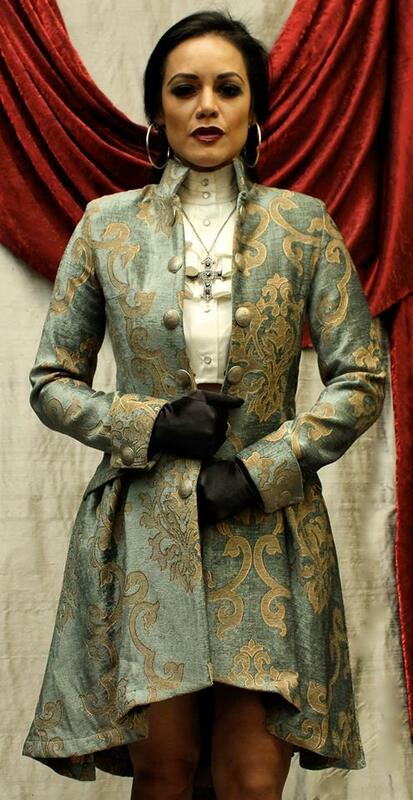 A luxurious modern romantic frock coat made in rich gold on green brocade fabric with an intricate tapestry pattern. The coat is fitted through the shoulders and tapered at the mid-section with a very flattering fit, then flairs out at the hips in a romantic fashion. A European stand-up collar adds a stylish imperial touch. 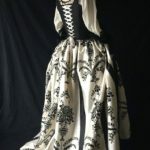 Twelve antique liberty coin buttons decorate the front with two more on the cuffs and two on the waist in back. A roomy hip pocket on either side. Fully lined inside in rich black satin.